Ordinary Vegan’s CBD Oil Drops are from North America’s top brand of hemp-derived CBD Oil products. CBD Oil drops are vegan, organic, gluten-free, non-GMO, plant-based and the most consistently pure product family in the industry. CBD Oil is a nutritional supplement that is derived from agricultural hemp. CBD, also known as cannabidiol, is a promising phytocannabinoid that is capable of positively impacting nearly every organ system in the human body. CBD Oil has a balancing effect on the body and mind, and plays a role in restoring normal balance and physiologic homeostasis. CBD is non-psychotic (i.e. it does not result in feelings of euphoria) and has a remarkable safety profile. Consumed by adults all around the world, Ordinary Vegan CBD drops is trusted to deliver the purest, consistent and traceable cannabinoids in North America with naturally occurring Vitamin E, fatty acids, and cannabidiol. HOW MUCH SHOULD I TAKE? When beginning CBD oil from Hemp, it's best to start with the smallest dose possible. Everyone reacts differently to various supplements. As with any new product, it is important to become familiar with how your body responds to it before increasing the dose. Most people with chronic pain, arthritis, anxiety disorders and migraines begin with 5mg to 15 mg of CBD oil a day for 6-10 days. Each 1/2 dropper is 5mg of CBD oil. If they are feeling good, they cut back. If they are still feeling good, they cut back again until they find the right dosage for their problem. It is important to administer consistent measurable doses of CBD to understand what dosage is going to work for your unique body and symptoms. CBD oil drops can also be used topically. 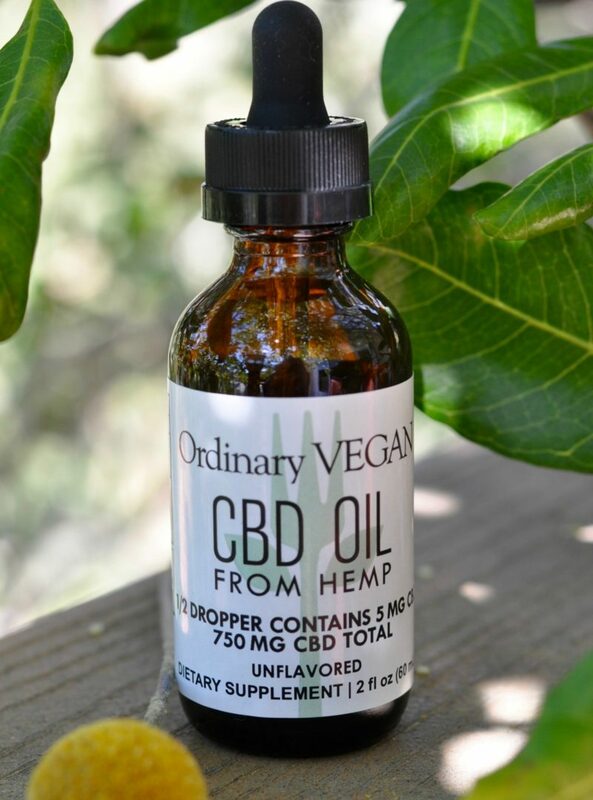 Ordinary Vegan CBD Oil Drops are vegan, gluten-free, non-GMO and made from hemp-derived CBD Oil, delivering cannabinoids (CBD), naturally occurring Vitamin E and fatty acids to support balance in your body and mind. If you are planning on taking CBD with other medications, please consult with your doctor. Listen to the Ordinary Vegan podcast to understand how CBD interacts with the body.